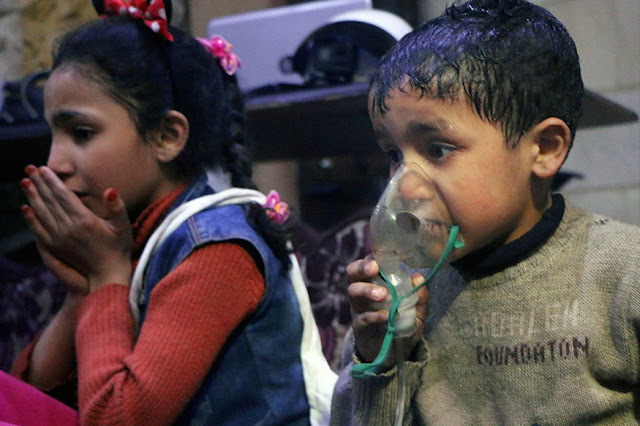 VietPress USA (April 8, 2018): Hours after President Donald Trump accused Russian president Putin and Iran for backing "animal al-Assad" to use chemical weapon as Sarin gas to kill dozens Syrian civilians in a rebel-held town of Douma, Syrian state TV announced on Monday local time that U.S. attacked a Syrian air base with missiles at the T-4 airfield near Homs, which is close to the ancient city of Palmyra in central Syria. The United States denied attacking the Syrian base. A statement from the Pentagon said: "At this time, the Department of Defense is not conducting air strikes in Syria. 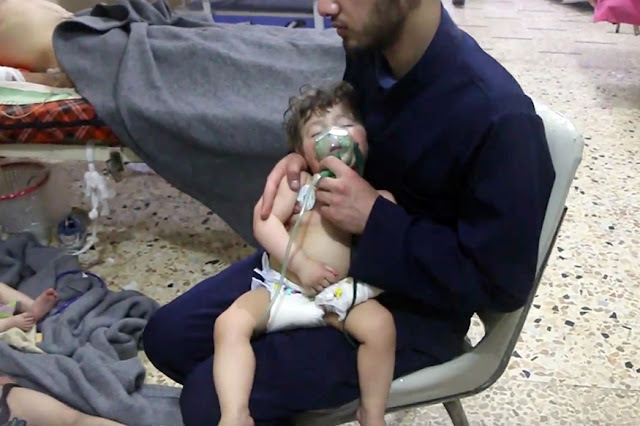 However, we continue to closely watch the situation and support the ongoing diplomatic efforts to hold those who use chemical weapons, in Syria and otherwise, accountable." AMMAN (Reuters) - Syrian state TV said on Monday the United States was suspected of striking an air base hours after U.S. President Donald Trump warned of a "big price to pay" as aid groups said dozens of people were killed by poison gas in a rebel-held town. The United States denied attacking the Syrian base. When asked about the explosions, an Israeli spokeswoman declined to comment. Israel has struck Syrian army locations many times in the course of the conflict, hitting convoys and bases of Iranian-backed militias that fight alongside Syrian President Bashar al Assad's forces. Syrian state TV said there were casualties in what it said was a suspected U.S. missile attack on the T-4 airfield near Homs, which is close to the ancient city of Palmyra in central Syria. A Syrian military source was quoted as saying air defenses shot down eight missiles fired at the base. Defense analysts say there are large deployments of Russian forces at the base, and jets fly regular sorties from there to strike rebel-held areas. As international officials worked to try to confirm the chemical attack, Trump took the rare step of directly criticizing Russian President Vladimir Putin in connection with the incident. 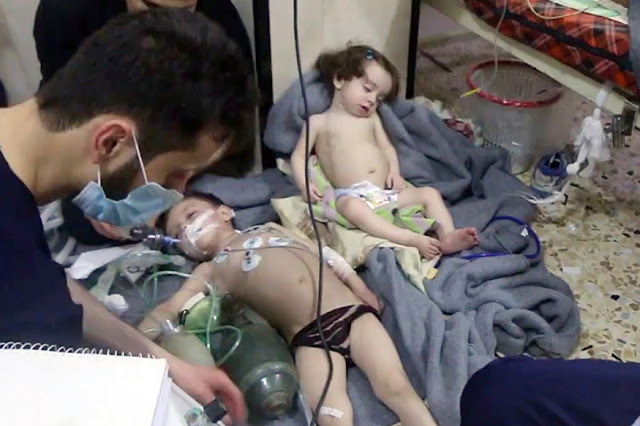 The Syrian government denied its forces had launched any chemical assault. 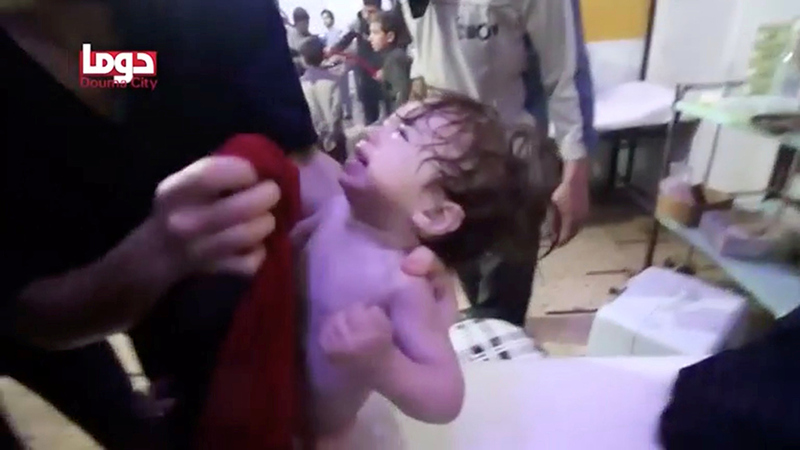 Russia, Assad's most powerful ally, called the reports fake. The Russian Foreign Ministry warned against military action on the basis of "invented and fabricated excuses". 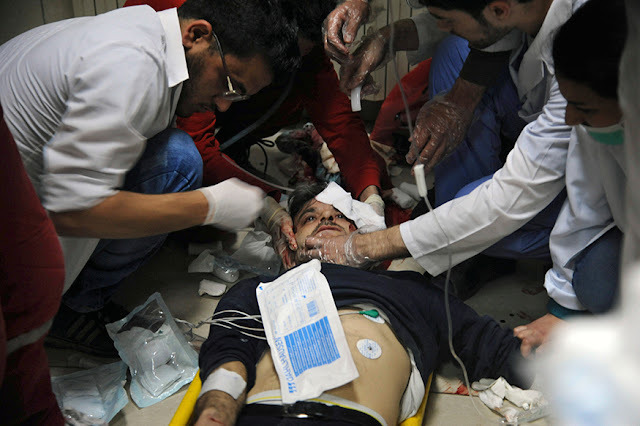 The Syrian government launched a fierce air and ground assault on Douma, the last rebel-held town in the eastern Ghouta district, last Friday. 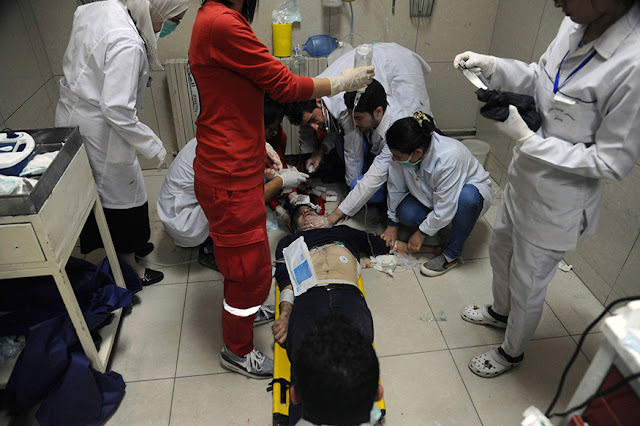 The medical relief organization Syrian American Medical Society (SAMS) and the civil defense service, which operates in rebel-held areas, said in a joint statement 49 people had been killed in the suspected gas attack. 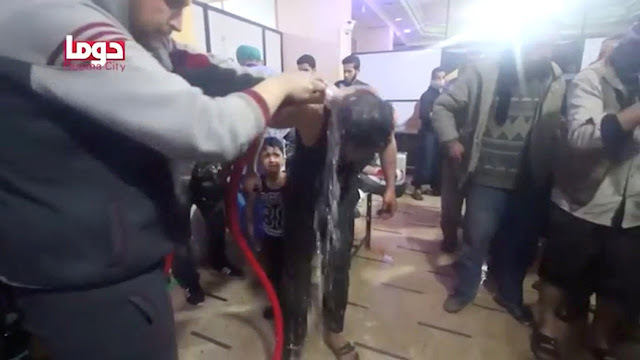 One video shared by activists showed bodies of about a dozen children, women and men, some with foam at the mouth. 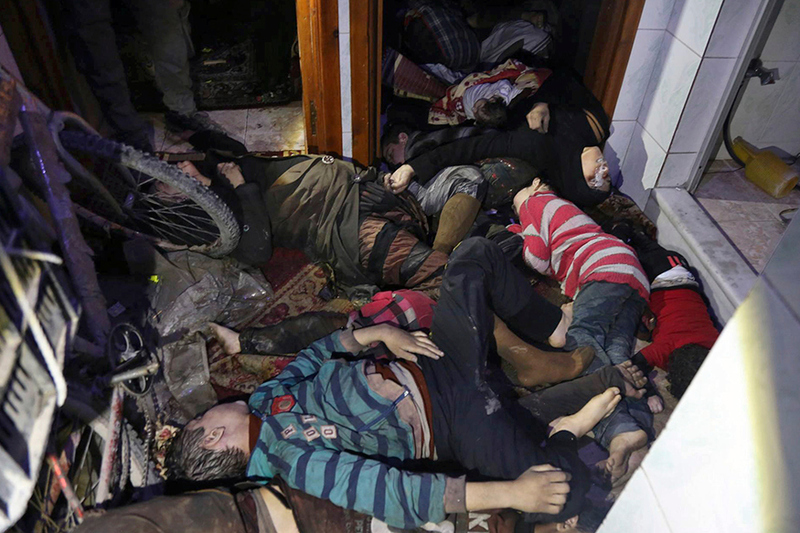 "Douma city, April 7 ... there is a strong smell here," a voice can be heard saying. U.S. government sources said Washington's assessment of the Saturday attack was that chemical weapons were used.